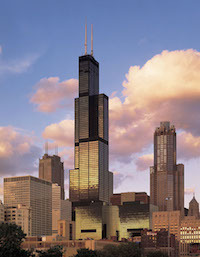 Although it costs around $20 (children around $10), a trip to the top of the Willis Tower is well worth the money. You’ll find a "Skydeck", which is a perfect vantage point from where you can look out over the city and its surroundings—all on the 103rd floor at 412 metres of altitude. 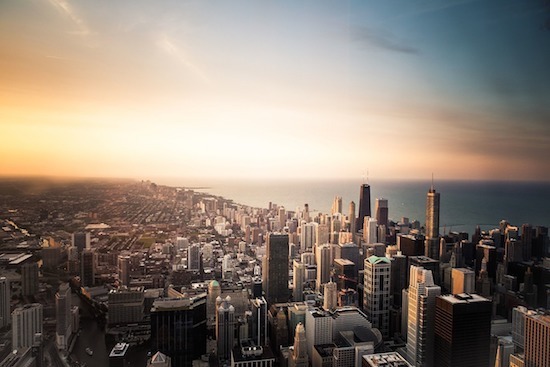 You’ll get a breathtaking view of Chicago and there’s also the chance to look out at the four states Illinois, Indiana, Michigan and Wisconsin. "Skydeck" is open from 9:00 to 10:00 every day from April to September, and from 10:00 to 20:00 the rest of the year. Chicago is one of America’s top sport cities with large teams in the greatest American sports. 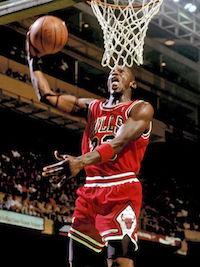 Perhaps the most famous one is the basketball team, The Chicago Bulls, who became world famous during their period of greatness in the 90’s when superstars like Michael Jordan and Dennis Rodman played for the team. The Chicago Bulls play at the United Arena, which has room for over 23,000 spectators, and to see a match at this great arena is a truly special experience. If you want to see two true American sports like baseball and American football, you should try to get tickets to The White Sox (baseball), The Chicago Cubs (baseball) or The Chicago Bears (football). Chicago Bears games especially are often sold out several days before the game, so tickets should be booked in advance. You can sometimes get tickets during game days for baseball games, but it’s not a bad idea to do it in advance. Anyone who likes hockey and follows the NHL will know of The Chicago Blackhawks. 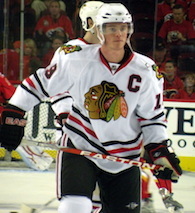 The Chicago Blackhawks are the city’s hockey team and in recent years they’ve done very well in the NHL. Just like with the other sports teams, their games are followed by thousands of Chicago locals and they also share the great United Arena with the Chicago Bulls, which means that there are plenty of people there to watch the team play. Whether you like hockey or not, a Blackhawks game will be a really cool experience. Once you’ve got hold of a ticket for one of Chicago’s sports teams, it’s a good idea to be there with plenty of time to spare as it might take a while to find your seat at the big arenas. Just like in New York and many other major cities in the United States, there’s a neighborhood in Chicago that is entirely influenced by China. In Chinatown in Chicago, there are plenty of restaurants and bakeries that are filled with Asian food. Not to be missed is testing the almond cakes or chestnut cakes, both of which provide a special taste experience. For those who want to bring home a Chicago shirt or other souvenirs, there are plenty of those kinds of things in Chinatown. Prices are usually lower here and there’s a large selection in the shops along the streets. Riding the subway is perhaps not the most interesting thing to do in a big city like Chicago, but it can be a fun and exciting experience to let the subway take you to different places you wouldn’t normally have visited. The subway system of Chicago is full of pleasant stops to get off at for a while and explore the various districts of the city. It’s easy to be fascinated by the different ethnicities and styles that characterise the different areas. Once you’ve bought a one-day-ticket you can ride the subway all day and also switch to intersecting subway lines. For example, there’s a free transfer between the blue, orange, pink, brown, green and purple lines at the Clark/Lake station. 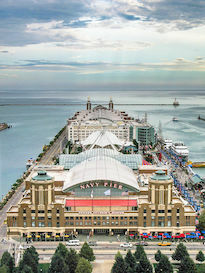 A great place to go to if you’re looking for lots of differenct things is the navy pier in Chicago. Out on the pier you’ll find various restaurants and shops, as well as a number of attractions like the Ferris Wheel, a big boat swing, an IMAX cinema and an 18-hole mini golf course. It’s also possible to go on different sightseeing boat trips that provide a stunning view of Chicago from the waters of Lake Michigan. Whether you are alone or in a group, you won’t be disappointed after walking around and experiencing the entertainment that the pier has to offer. Be sure to visit the Riverwalk if you’re looking for an environment that’s a little bit more relaxing than the one you’re able to experience at the harbour pier. Riverwalk is a promenade that runs along the waterfront of downtown Chicago. Here you can walk around and admire parts of Chicago’s most beautiful architecture or just sit down on a bench for a while and relax. Along the Riverwalk, you can also find nice restaurants and cafés, as well as different stops from which you can take boat rides or taxi boats on the water. Chicago is home to several well-known American breweries and once you’re in town you shouldn’t miss the chance to visit one of them. Some of the breweries are Goose Island, Half Acre Beer Company, Pipeworks Brewing Company and Revolution Brewing. If you visit one of the breweries, it’s possible to get a guided tour and sample the different beers. Whether you’re a beer enthusiast or not, a trip to one of the breweries might be a different and enjoyable experience. If you’ve got plenty of energy left and you’re not afraid of water, it’s possible to rent kayaks to paddle around in while exploring Chicago. You can get around on Lake Michigan and the Chicago River in a kayak, get a great view of the city and discover new parts of the cityscape. 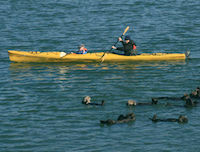 Renting a kayak is a popular tourist attraction and there is often information about this at the hotel where you're staying or any other places that have tourist information. The price is usually around $20 per hour.